Freshwater crustaceans could be the key to understanding how the chytrid fungus persists in the ecosystem long after the last amphibian is gone. Scientists have found a new culprit in spreading the disease that's been driving the world's frogs to the brink of extinction: crayfish. "This pathogen is bad news. It's worse news than any other pathogen in the history of life on Earth as far as we know it," says Vance Vredenburg, a conservation biologist at San Francisco State University who studies frogs but did not work on the new study. The chytrid fungus was only discovered in the late 1990s. Since then, scientists have been scrambling to figure out how it spreads and how it works. 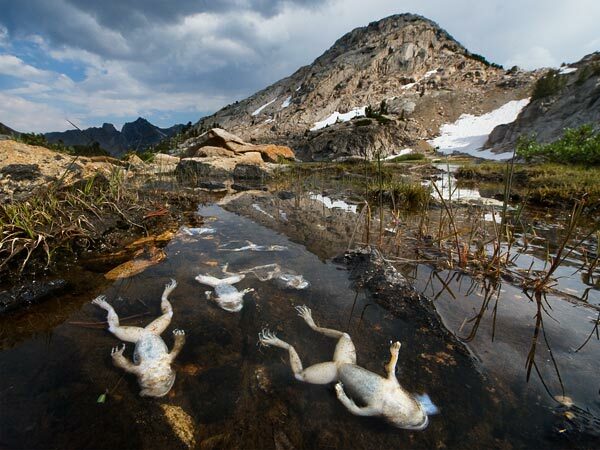 Dead frogs killed by the amphibian chytrid fungus. One possible reason is that chytrid infects other animals. For a study published today in Proceedings of the National Academy of Sciences, Taegan McMahon, a graduate student in ecology at the University of South Florida in Tampa, looked at some possible suspects and focused on crayfish, those lobsterlike crustaceans living in freshwater. They seemed like a good possibility because they're widespread and because their bodies have a lot of keratin, a protein the fungus attacks. In the lab, McMahon exposed crayfish to the disease and they got sick. More than a third died within seven weeks, and most of the survivors were carrying the fungus. She also put infected crayfish in the water with tadpoles—separated by mesh, so the crustaceans wouldn't eat the baby frogs—and the tadpoles got infected. When McMahon and her colleagues checked out wetlands in Louisiana and Colorado, they also found infected crayfish. The study doesn't answer every last question about the disease. For one thing, crayfish are common, but they aren't everywhere; there are no crayfish in some of the places where frogs have been hardest hit, Vredenburg says. But, he says, the new research shows that "we need to start looking a little more broadly at other potential hosts."